When I was pregnant with Aviah, I didn't really purchase maternity clothing. I wore a lot of maxi dresses towards the end of my pregnancy, since they were easy to throw on and go. Plus, they stretched, so they fit comfortably. Now that I'm on my second pregnancy, I didn't want to necessarily wear those same dresses over and over again, though I will still be wearing them of course. I wanted to add in some new inexpensive pieces and so, I did a little shopping at ASOS. What I love about them is that they're super affordable and the quality is so good. 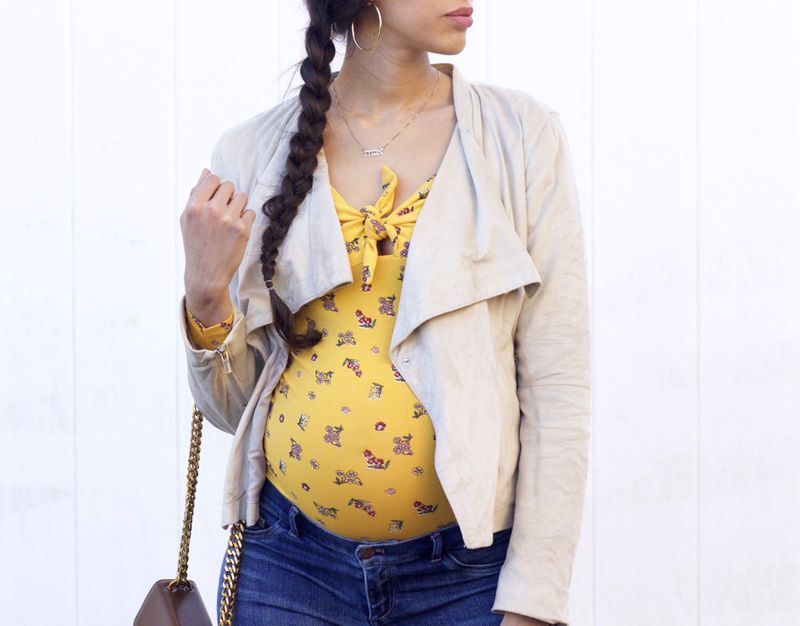 I also love the fact that many of their maternity pieces also come in non-maternity (like this top). The same goes for regular, petite and plus sized clothing, too. Aside from the cheerful yellow, what got my attention were the ditsy florals. I love wearing florals for spring, no surprise, but I love when they're done in different ways that make them look and feel fresh and well, not so typical. Ditsy florals are simply a smaller scale of the print, which can be super flattering. It makes the area you're wearing it appear smaller or prevent it from appearing larger. Obviously the opposite is true when working with larger florals, so that's something to keep in mind. So, if you're hesitant to wear a colorful floral piece out of the fear of it drawing too much unwanted attention, just go for a smaller floral and you'll get your color fix, while creating the visual effect you're looking for. For the rest of the look, I went with various brown shades to add an earthy feel that allowed for the top to stand out. The next time around, I'll swap out the boots for a pair of red mules and remove the suede jacket, making it perfect for transitioning into summer! I hope you found some inspo from today's look and feel motivated to start to bring out your florals and/or other spring prints! Thanks so much for stopping by, my sweet friends, and I look forward to seeing you all on Wednesday!